College Librarian for Government Arts and Science Colleges in Tamil Nadu Collegiate Education Service - 30 Posts - Basic Pay 15600 Academic Grade Pay 6000 plus allowances in Pay Band III category (Basic Pay 57700 plus allowances in Pay Matrix Level 24) - Post Graduate Degree in Library and Information Science / Documentation Science / Information Science and consistently good academic record with UGC NET / SET / SLET certification or PhD - Age 35 years (should not have completed) for UR candidates (except Destitute Widow) ; All others there is no age limit. 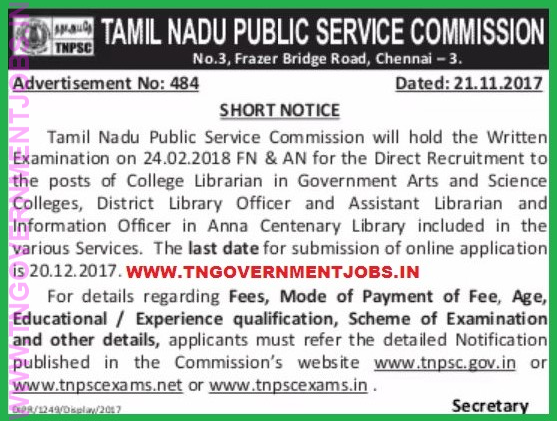 District Library Officer (DLO) for Department of Public Libraries in Tamil Nadu Educational Service - 9 Posts - Basic Pay 15600 Grade Pay 5400 plus allowances in Pay Band III category (Basic Pay 56100 plus allowances in Pay Matrix Level 22) - Post Graduate Degree in any subject and Post Graduate Degree in Library and Information Science / Documentation Science / Information Science with minimum 3 years experience in any of the libraries in Supervisory Cadre - Age 35 years (should not have completed) for UR candidates (except Destitute Widow) ; All others there is no age limit. 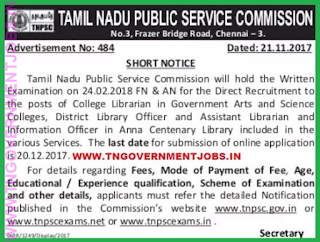 Assistant Librarian and Information Officer (ALIO) for Anna Centenary Library Kotturpuram Chennai, Department of Public Libraries - 3 Posts - Basic Pay 9300 Grade Pay 4700 plus allowances in Pay Band II category (Basic Pay 36700 plus allowances in Pay Matrix Level 17) - Post Graduate Degree in any subject and Post Graduate Degree in Library and Information Science / Documentation Science / Information Science - Age 30 years (should not have completed) for UR candidates (except Destitute Widow) ; All others there is no age limit. College Librarian & DLO Posts : Maximum age limit is 35 years (should not have completed) for UR candidates (except destitute widow). No maximum age limit for BC / BCM / MBC / DNC / SC / SCA / ST candidates and Destitute Widow of all communities, includes UR. PwD : Persons with Disabilities will get additional 10 years relaxation. Paper I : Library Science (PG Std Level) Total 200 MCQs ; each questions will carry 1.5 marks ; Total 300 marks. Examination Centres : Chennai, Madurai and Coimbatore. 16.02.2018 : Written examination postponed, vide notification no.27A/2018 dated 15.02.2018. No. minimum qualification is any PG + PG in Lib Sc. I completed PG+MLIS PROVISIONAL CERTIFICATE DATE 27-12-2017AS I ELIGIBLE OR NOT ? It should be on or prior date of the advertisement. Mam any reason known for the postponement of librarian exam? or the tentative date of exam??? ?